Over 500 cyclists set off from Gonzaga College High School in Washington DC in the wee morning hours of Friday August 1st, to raise money for autism awareness and research. 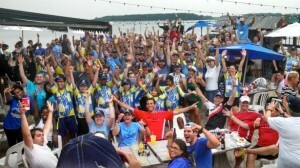 They crossed the finish line in Dewey Beach, DE at around 2 p.m., where they were met with warm greetings and cheers. “Bike to the Beach” is a 105-mile charity ride from Washington DC to Dewey Beach, DE, aimed at raising awareness and money for Autism Speaks and local autism advocacy organizations. Their goal this year was to raise over $450,000 for the cause. “Bike to the Beach” began in 1999 when two friends biked from Washington, DC, to Bethany Beach, Delaware. It quickly became an annual event, with more friends joining each year, and in 2007, the organization was incorporated as a nonprofit.